Manufactured from choice, fully ripe and matured Virginia tobaccos - mainly American. An elegant flavour with a full and pleasant mild taste has been added. 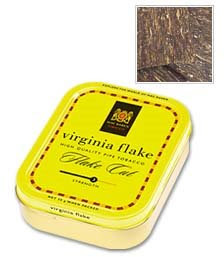 Start: Opening the tin reveals a nicely stack of sheet cakes of Virginia flake cut hidden under a golden wrapper. Smells as it should...Virginia-y...provokes a mouth watery sensation...not sure because it smells good or you can smell insta-bite. The joy in this type of cut is rubbing. Who doesn't like to touch their smoke a little bit? I love getting in there and sifting and rubbing. Good times. Now light it up but be gentle. No huffing here. Mid-Bowl: If smoked carefully the Virginia's come out nicely. A lemon, tart, honey splashes the pallet. This can go bad though if you puff harder to derive more of that goodness. Finish: Decent smoke but a lot of care, at first, can take away from this blend. Finishes nicely. Not bad but I will continue to my search for something more in VA.